As of 2017 there were over 3.6 million US students who participated in competition riflery. The vast majority of those programs were locally funded through private funds, although larger intuitions like the NRA and third party scholarships have allowed students the opportunity to compete at the NCAA level. Since 2016, the NRA has contributed more than a million dollars to over 300 youth oriented shooting programs. The goal of such bursaries and funds is to encourage the growth of firearm education and the sport of shooting in general. The importance of shooting programs that educate youth of the importance of gun safety and handling is paramount in keeping the sport alive and flourishing. Currently, 42 NCAA programs now sport smaller caliber rifle competition. Currently the NRA stands as the single largest contributor toward youth shooting programs. The largest of which, the NRA Grand Scholarship, is valued at over $20,000 and is awarded annually. Despite the growing number of supporters and practitioners of the sport, riflery is still in an infancy and struggles to find the funding and support needed for education, new equipment, staffing and maintenance. Since 2001, Gun News Daily has been a trusted voice in the Second Amendment community. But we do more than cover breaking gun news — much more. Our reviews and gun accessories resource are written to bring some clarity (and fun) to the shopping process for your guns. Since the inception of GND nearly 16 years ago, we have maintained the vision that shooting is a sport, not just a hobby. We also believe in practicing what we preach. 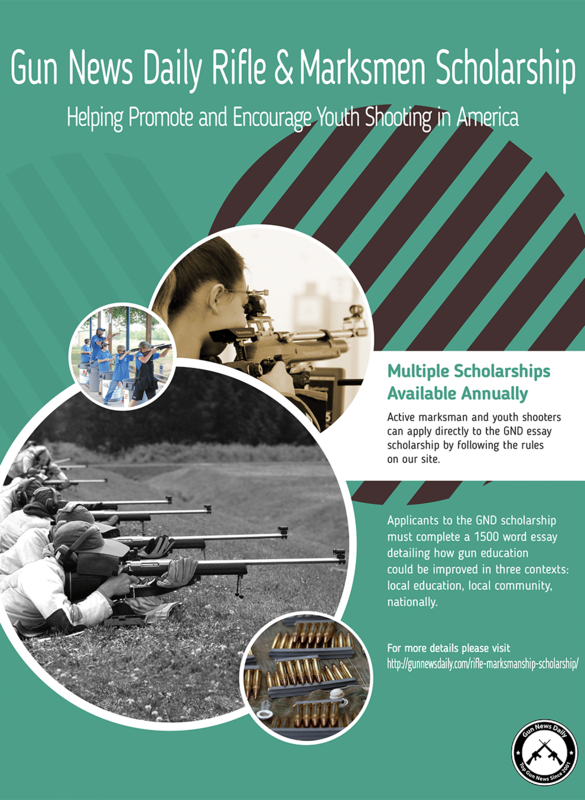 So, to help nurture new generations of marksmen and women, we created the GND Annual Scholarship to support the education of young men and women who have a passion for shooting. In my family, learning to handle firearms started at a young age. It wasn’t something that happened when you turned 18 or 21 — it was part of growing up in the family. Our goal with the GND Scholarship is to bring that same ethos to other parents and children across America. The NRA Grand Scholarship judges students on their online applications, oral presentation and naturally, their shooting ability and scores. Applicants of the bursary should also provide a detailed plan on how they plan on implementing NRA-sponsored firearms education programs in the own local area. Since Gun News Daily is an online publication, we lack the ability to accurately judge your shooting ability, therefore our scholarship attempts to help the sport of riflery where we think we can help the most – education. Students can use personal stories and anecdotes, however as a news publication we will give preference to submissions that are cited and sourced from accredited sources. Terry Illes – Winner of $1000 USD. Terry’s article detailed how social media can be used to augment firearm awareness and safety in a cheap cost effective manner. It provides valuable insight for local gun blogs, businesses and community organizations. Scott’s work examined how people in other countries approach gun safety, education and develop their own local youth shooting organizations. It was a well-documented case study providing some valuable insights for those who are looking to get a cross-cultural perspective on the sport of riflery. Please submit the file as a functional word document. All versions are acceptable. 1.5 space lines with proper indentation and punctuation. All sources should be cited as per APA guidelines. We will check all sources. Completed scholarship application with all required documentation need to be postmarked no later than May 31st. Submissions should be sent to [email protected] Submissions should include the application form below as well. All submissions must be titled in the subject line “Scholarship Submission”.